The news about exports was dismal throughout 2015. For 12 consecutive months, from January to December, India’s total exports, in terms of US dollars, were significantly lower than in the corresponding months of the preceding year. This was, perhaps, a nadir. The problem is not altogether new. It has persisted for some time. Export performance in the recent past has been poor in relation to the needs of the economy and in comparison with some other developing countries. Table 1 presents the basic contours of India’s foreign trade from 2010-11 to 2014-15. It reveals a stagnation in the dollar value of exports, around $300 billion per annum, in the past four years. It also shows that, on average, exports were able to finance just two-thirds of imports. Consequently, the trade deficit reached alarming levels, at 10% of gross domestic product (GDP), in 2011-12 and 2012-13. Even in the remaining three years, its average level, at 7% of GDP, was among the highest for countries in the developing world. The associated current account deficit would have been simply unmanageable, were it not for software exports at more than $70 billion per annum, and remittances in the range of $70 billion per annum, in the past three years. In addition, world prices of crude oil dropped from around $110 per barrel in end-June 2014 to less than $50 per barrel in end-January 2015, to remain in the range of $50 per barrel through the year. But, in mid-January 2016, the price plunged below $30 per barrel, its lowest since 2004. This windfall gain has eased what could have been an exceedingly difficult situation. It must be recognized that the global economic situation has been difficult for some time. The financial crisis that surfaced in the US in late 2008 led to a sharp contraction in world trade that was much greater than the fall in global output. The Great Recession, which followed in its aftermath, persists even now. Recovery in output is slow, uneven and fragile. The recovery in trade is just as slow. During 2010-14, India’s export performance conformed to the average. Its share in world exports stayed in the range of 1.5%, while its share in developing countries’ exports remained unchanged at 4%. Yet, over the same period, some Asian economies, such as China and Vietnam, managed to increase their share in world exports. India probably fared worse than the average in 2015. More importantly, its performance in exports of manufactured goods was clearly below par throughout, as its share in world manufactured exports (1.3%) was significantly less than its share in world manufacturing value-added (2.3%). The slow growth in world trade does impose a demand constraint on total exports from developing countries. But this demand constraint is not binding for single countries such as India, particularly if their share in world exports is small. After all, in the same world economy, several Asian countries boosted their export performance by increasing their share in global exports. Even if it is a convenient alibi, it would be misleading—if not deluding ourselves—to blame the world economy for India’s dismal export performance. The explanation lies in domestic economic factors. And the main culprit is the exchange rate of the rupee. The exchange rate is a crucial price that determines the rupees earned per dollar of exports (and rupees paid per dollar of imports). Thus, it shapes the price competitiveness of exports in world markets and the profitability of exports for domestic firms. It also influences the relative profitability of exports, compared with sales in the domestic market, which is particularly important in India because most exports are exportables that can be sold either in the world market or in the home market. Figure 1 compares the depreciation of the rupee vis-à-vis the dollar during 2015, with that of the euro and the currencies of 11 emerging markets in the developing world. It shows the rupee fell the least, just 4.2%, a fraction less than the Chinese renminbi, much less than the euro at 13.6%, and way below the depreciation in the Turkish lira at 25% or the Brazilian real at 44%. In the first fortnight of January 2016, nervous markets depreciated both the Chinese renminbi and the rupee by a further 1.5% vis-à-vis the dollar. Such a comparison of nominal exchange rates, which is by definition bilateral, is necessary but not sufficient. There are two derived concepts that are important. The nominal effective exchange rate (NEER) is an index that measures the value of a currency against a weighted average of a basket of currencies. The real effective exchange rate (REER) adjusts NEER for differences in the rates of inflation at home and abroad. NEER and REER can be either export-based (with appropriate weights for currencies of countries that are major markets for, or competitors in, its exports) or trade-based (with appropriate weights for currencies of its important trading partners). Export-based effective exchange rates for India, both NEER and REER, for every month from September 2013 to November 2015, are plotted in Figure 2. These are more appropriate measures of how the competitiveness of Indian exports, shaped by the exchange rate, in nominal and real terms, changed over time. It shows that the NEER index appreciated by 8% (from 70 to 75.6 compared with 100 in 2004-05). In contrast, the REER index appreciated by 14% (from 101.2 to 115.2 compared with 100 in 2004-05). Obviously, the competitiveness of exports over the past two years was diminished significantly by the exchange rate of the rupee. There are, of course, other underlying domestic factors that constrain export performance. Despite massive import liberalization, access to imported inputs necessary for export production remains a serious problem. The infrastructure—power, roads, transport, communication and ports—is simply inadequate. Non-price factors that affect the competitiveness of manufactured exports, such as quality or delivery dates, persist. But these usual suspects have been with us for a long time and cannot, by themselves, explain the dismal export performance in recent years. The persistently overvalued exchange rate in India means that the rupee is overpriced. Why? In the past, when exchange rates were fixed, devaluations often had negative political consequences for governments. However, in the present world of floating rates, currencies do depreciate or appreciate. Hence, the politics of exchange rates is passe. But it might have a corollary in the form of a macho belief system that thinks of a strong rupee as a plus point for the government. Any such belief is flawed. It might just be a camouflage for the real reason, which is never made explicit. This stems from the compulsion of financing large current account deficits (in the balance of payments) though capital inflows provided by foreign institutional investors. The economy needs a strong exchange rate for confidence, together with high interest rates for profitability, to sustain such portfolio investment. This solution often turns out to be worse than the problem. It erodes the competitiveness of exports over time and enlarges the trade deficit. Larger trade deficits and current account deficits require larger portfolio investment inflows, which beyond a point undermine confidence, and create adverse expectations, even if the government keeps the exchange rate pegged. When a stifling of exports does ultimately force an exchange rate depreciation, confidence may simply collapse and lead to capital flight. This is the story of many currency crises across the developing world over the past two decades. It is essential to recognize that the exchange rate is a price which matters for the economy in many spheres much more important than portfolio investment inflows that can be unstable, fickle or volatile. 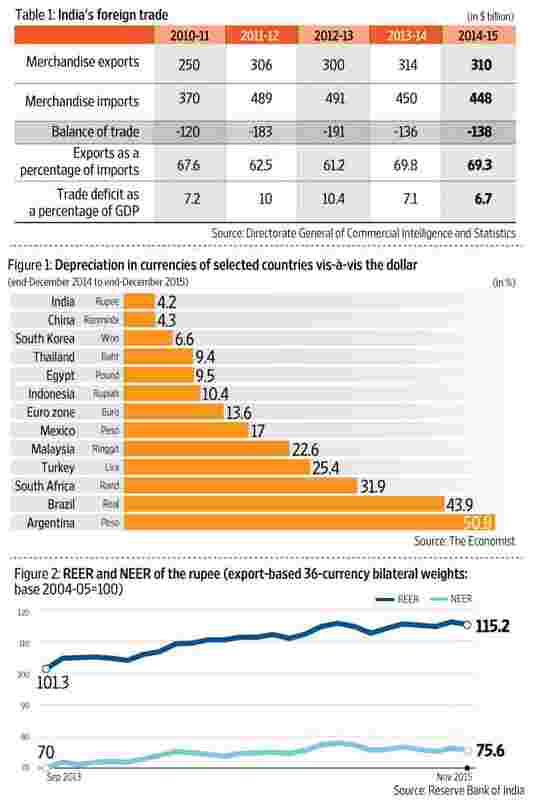 The overvaluation of the rupee, which makes exports difficult and imports attractive, must be corrected. The time has come to let the rupee depreciate not just in nominal terms but also in real terms. A more appropriate exchange rate would help reduce the balance of trade deficit to manageable proportions by stimulating exports and dampening imports. It would also help domestic manufacturing firms competing with imports to Make in India and combat the onset of de-industrialization. Even for those who want the comfort of large foreign exchange reserves, exports and trade surpluses (China and Taiwan) are a far better way of accumulating reserves than portfolio investment inflows (India) that can be withdrawn on demand. Clearly, the exchange rate is a critical determinant of export performance and matters for the economy in other domains. Similarly, exports play a vital role in the performance of the economy. In the external sector, exports are a means of financing imports, which are essential to sustain desired levels of consumption, investment and production in the economy, while keeping the trade deficit and external borrowing within manageable proportions. At the macro level, exports not only provide an external market that complements domestic demand as a driver of economic growth on the demand side, but also impart efficiency and competitiveness in domestic production by enforcing a cost discipline on the supply side. India cannot aspire to sustainable high growth without a dramatic transformation in its export performance. Deepak Nayyar is emeritus professor of economics, Jawaharlal Nehru University, New Delhi. He served as chief economic adviser to the government of India, from 1989 to 1991, and as vice chancellor, University of Delhi, from 2000 to 2005.